Can Interactive Books Get Kids to Read More? Booksurfers is a new e-book adventure series aimed at children age 9 to 12. In a lot of ways, it fits squarely within the long tradition of children's adventure stories: a group of kids is thrust into a strange scenario where they must use their wits to solve a problem, where they travel to strange and exotic locations to battle evil forces. But Booksurfers takes these generic conventions and gives them a very contemporary twist. The four kid characters in Booksurfers -- Ryan, Jake, Becca and Harriet -- use a digital gadget called The Nautilus in order to"jump into" classic adventure stories in order to steal fictional artifacts. The evil Dr. Crookshanks compels them to do so, and he's taken their parents hostage in order to force the kids' cooperation. For those familiar with Mary Pope Osborne's popular Magic Tree House series, the notion of traveling back in time or into magic lands may sound quite familiar, and as I read through one of the two available titles -- The Wonderful Wizard of Oz -- I was reminded of how much my son loved that series when he was first learning to read chapter books. That's the aim, in part, of the Booksurfers series: pique children's interest in reading, and specifically in reading classic works of fiction (the two available titles so far are The Wonderful Wizard of Oz and Treasure Island). It isn't simply that the children in Booksurfers "jump into" these familiar classic novels and interact with characters from them. The e-books actually contain a number of passages that are lifted out of the earlier novels. These are hyperlinked, and when you click on the pages in your Kindle, you jump to that passage in the original novel. 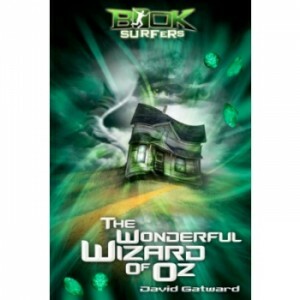 The full copy of Treasure Island and The Wizard of Oz is included in the download of the e-book (Booksurfers uses public domain works). But will this get more kids reading more of the classics? Last year, Scholastic released a report stating that kids said they'd read more if they had an e-reader and access to digital books. In fact, 57% of kids age nine to 17 surveyed said they were interested in reading via e-books. And one-third said they’d read more for fun if they had more access to books on an electronic device. This response cut across demographics and included kids who read daily, once or so a week, and even those who ready rarely. In that case, Booksurfers, with its digital-only distribution, may find a way to increase interest in not only its own titles but in some of the classics. On a personal note, as I read through The Wonderful Wizard of Oz, I actually found the hyperlinks a little jarring. Although I'm accustomed to this type of reading and linking on the Web and in blog posts, it still feels a little out-of-place in a novel. I'm not sure my brain can easily flip between stories this way. That said, I was reminded of how wonderful Frank L. Baum's books are, how different the novel is from the Hollywood film -- and if that experience makes a young reader attracted to the novels in either Baum's or Booksurfers' catalog, then it's good news. Plus, a young reader's experience is sure to be different than my own, especially as e-readers increasingly become our primary source for reading. Booksurfers plans to release more titles this year, including Robin Hood and A Christmas Carol. The company has also indicated that it may pursue print versions, but only if they can find the right print publishing partner to maintain that hyperlink functionality in paper form.